Grab your cat glasses possums and put a trip to one of the hottest, Los Angeles theaters around on your itinerary this month. Aussie funny lady, Dame Edna Everage will be performing at the Ahmanson Theatre from now January 24th through March 15th, 2015. As you might have already heard, it’s the lilac-haired diva’s farewell tour. So if you don’t get yourself in gear soon and buy cheap tickets from us, you may just miss out on seeing Barry Humphries’ one-of-a-kind, award-winning character forever. Dame Edna’s final performances at the Ahmanson Theatre on North Grand Avenue are a mixture of early afternoon and evening show times. We’d suggest selecting one that allows you to enjoy a meal at one of Los Angeles’ Aussie inspired restaurants. For example, if you plan on hitting a matinee performance, a stop at the Bronzed Aussie may be apropos. It is typically open daily and closes sometime between 3 and 6 p.m. The staff there serves authentic, Australian meat pies and sweets. 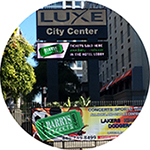 You can find it located on South Los Angeles Street, which is situated less than a 10 minutes’ drive away from the Ahmanson Theatre. Parking for Los Angeles theater patrons hoping to see the famous Aussie is typically available off of Grande Avenue and Hope Street. Self-parking is available off of Grande but be forewarned. The spaces tend to move faster than Dame Edna’s procession of laugh-out-loud punch lines. Consequently, it’s best to try and secure a spot for your ride around noon. If you can’t, expect to pay more for the valet parking facilities, which sit facing Hope Street. Either way, we’d suggest factoring at least a $25 allowance for parking into your theater plans or leave the vehicle at home and take public transit. See Dame Edna dance to her own beat one last time! You can purchase Dame Edna Tickets for all performances at the Ahmanson Theater. Use our special Promo Code DAME15 to get $15.00 off $100 or more on Dame Edna Tickets marked BV for the Ahmanson Theater performances. The discount code for Dame Edna tickets at the Ahmanson Theater can not be combined with any other offer. See our website for terms and conditions. 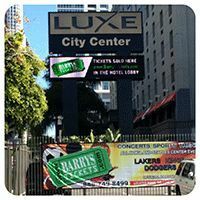 Barry’s Ticket Office is located just minutes from Ahmanson Theater!